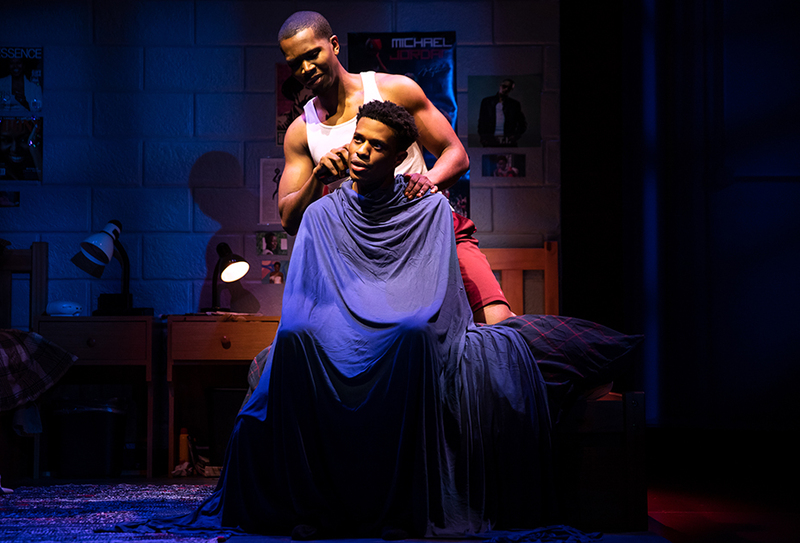 January 16, 2019: There is a lot less violence in Tarell Alvin McCraney’s Choir Boy at the Manhattan Theater Club, than there is in the Academy Awarding winning movie, adapted from his play, In Moonlight Black Boys Look Blue. Still, the stripped-down version of it that we see in this coming-of-age drama, equally challenges the way we think. Its language is that of spirituals, but not just the old standards. In Jason Michael Webb’s arrangements, well-known classics are delivered in a contemporary jazz style. 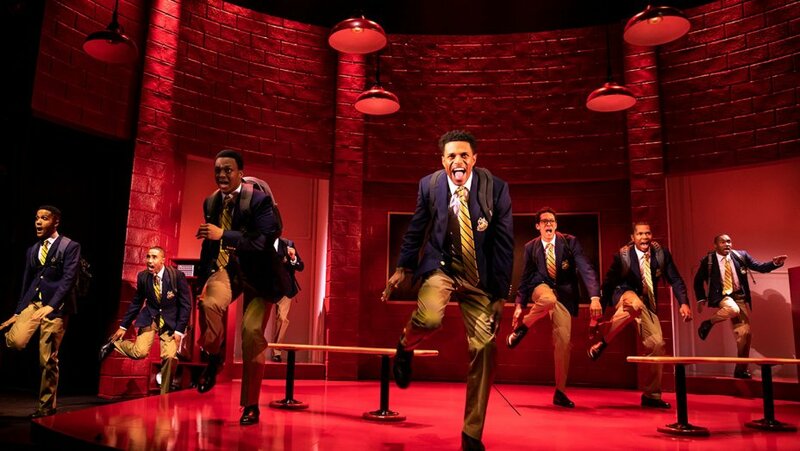 Camille A. Brown’s choreography is fierce and edgy, in the spirit of Bill Jones’ dances in Spring Awakening. 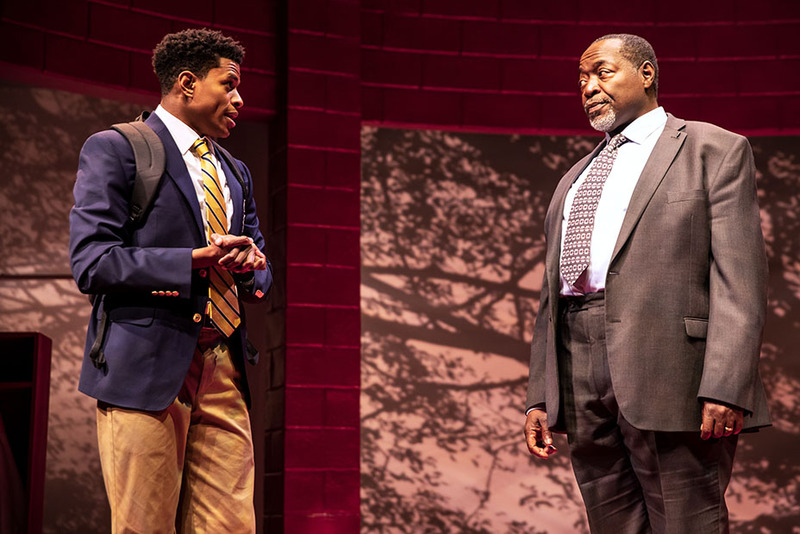 To his credit, Cooper’s Headmaster is sincerely kind, and necessarily stern. In a school in which privilege, racial strife, and hormones rage, he has a lot on his hands. Like the central character of Moonlight, Pharus Jonathan Young, played by the gifted Jeremy Pope, is gay. And while it wouldn’t be fair to say he’s confused, it’s clear that the world he needs to sort out is a confusing one for any lad. Especially for Jonathan who doesn’t have a family, or friends to support him. What he has, and what he shields himself with, is his love of singing. But other boys have that too, most noticeably, Jonathan’s arch enemy, Bobby (J. Quinton Johnson), the legacy kid, and the headmaster’s nephew. Regardless, the friction he creates with Jonathan – his homophobic name calling, and bullying, give Jonathan, as the leader of the chorus, cause to throw him out of the club. That his decision creates lots of flack is certainly predictable. That he gets away with it, is not. Sorting out the play’s message, a former teacher, Mr. Pendleton, emerges from retirement to help prepare these young men, for the world. 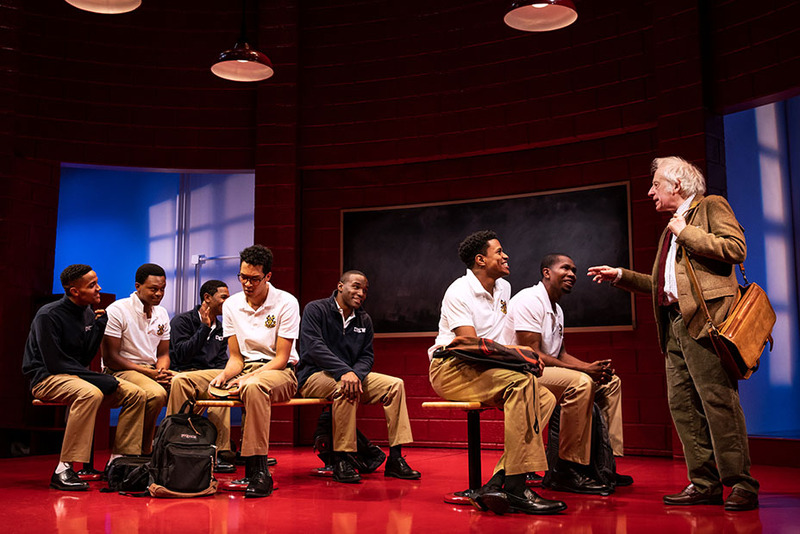 Arriving like a deus ex machina, even the veritable Austin Pendleton, playing himself, cannot achieve harmony between these warring students. Along with that, the student who actually acts out the violence, on which the plot hangs, is dismissed. To avoid a spoiler alert, it should be clear that the student in question is a sympathetic young man who needs to escape the poverty of his home, along with his abusive father. His act is wrongful, but hardly life threatening. The object lesson is that he’s a liar, lying to himself, as well as to others. And if Headmaster Morrow has a message, it’s to be true to oneself. That is the beauty of the story, which is neither moralizing nor derogatory about societal norms. It just lays out a situation, and allows us to share what is positively achieved by taking one’s own path. The gifted ensemble carries the story beautifully, and casually to a positive outcome, “Not to cross some man-made border but to find a place in our hearts that felt like peace.” Director Trip Cullman mines the material with sensitivity. Manhattan Theatre Club at the Samuel J. Friedman Theatre, 261 W. 47th St., NYC. Tue 7pm, Wed 2pm & 8pm, Thu—Fri 8-m, Sat 2pm & 8pm, Sun 2pm. Running time: one hour and 45 mins. with no intermission. $79—$149. (212) 239-6200. www.telecharge.com.